The Sony DSC-G3 was introduced on 8-January-2009 (read the press release), and has a 4x zoom lens that has a range of 35 — 140mm (in 35mm equivalent terms). With a focus on making photo sharing easier and more convenient, Sony today introduced the world’s first Wi-Fi enabled digital camera that uploads photos and videos to Web sites through any public hotspot due to its built-in Web browser. Resolution is 10.1 MP, and the size of the CCD sensor is a 1/2.3 ” (6.16 x 4.62 mm, 0.28 cm²). This gives a pixel density of 35 MP/cm². Storage: Memory Stick Duo / Pro Duo, Internal. Power: Sony NPFD1 Rechargeable Battery Pack. Weight (without batteries): 185 g (6.5 oz). Dimensions: 97 x 59 x 22 mm (3.8 x 2.3 x 0.9 in). Visit DPReview for the complete specs on the Cyber-Shot DSC-G3. ISO 80 Printed results look good at 11x14 with good color and detail. If you look really closely you can see some chroma noise in the shadows, but it’s not too bad. Printed at 13x19 inches, detail is a little too soft, and both luminance and chroma noise are noticeable. ISO 100 images are a little softer if you look very closely, but are still just fine at 11x14, despite our concerns when viewed at 100% onscreen. At ISO 200, detail gets softer, especially low contrast detail, but most prints will look fine at 11x14. ISO 400 shots look a little too smudged at 11x14, though. High contrast detail is fine, but large areas of limited contrast start to smear together. Printed results look better at 8x10. ISO 800 shots are too soft at 8x10, and color begins to fade. Usable detail improves at 5x7. ISO 1,600 shots are usable at 4x6, but large areas of low contrast will be softer than is acceptable to most, and ISO 3,200 is also somewhat usable, but grainy. Overall, not a bad performance from the Sony G3, better than most small folded-optic pocket cameras. Mike also provides a complete berakdown on how well the G3 connects to networks and browse familiar web sites such as Google. The Cyber-shot DSC-G3 is probably the epitome of Wi-Fi-enabled shooters with the built-in Web browser. We can already imagine ourselves sending images to our Picasa account at while Starbucks. But we need to fully test out the G3 before we can conclusively access the browser’s functionality. As long as you stick with ISO 200 and below, which unfortunately rules out full auto operation, the photos look relatively sharp, with low noise, consistent and correct exposures, and nicely saturated colors. At ISO 400 you start to see softness and color noise, though how obtrusive it is depends upon the content of your shot. 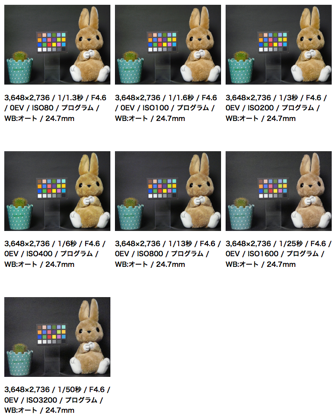 The G3 supports sensitivities up to ISO 3,200, but the highest usable setting is probably ISO 800. Though the G3 only shoots 640x480 30fps movies—they’re good as long as you remember to bump quality up to Fine—it does support optical zoom during capture. User reviews on Sony Style USA (click on the reviews tab) — At the time of writing, Jun 29, 2009, the G3 has an overall rating score of 5 out of 5 stars based on 5 customer reviews. Customer reviews on Amazon — At the time of writing, Jun 29, 2009, the G3 has an overall rating of 4 out of 5 stars based on 2 reviews. Sony Cyber-shot DSC-G3 Test Images at Imaging Resource — That’s the test photos — head here for the gallery of real-world photos. They’ve also provided a 10.5 MB, 8-second VGA-quality MPEG file for you to download. Full resolution Sony DSC-G3 ISO test samples at dc.watch (Japanese) (Google’s English translation) — ISO 80, ISO100, ISO200, ISO400, ISO800, ISO1600 and ISO3200 are tested, and you get to download some real-world snapshot photos. Additionally, you can see how a web page looks like on the G3’s screen (source: dc.watch | Google’s English translation). More real-world photos, studio tests and operation of the G3’s rear LCD for connecting to a LAN or Wi-Fi, launching a web browser and typing on the on-screen keyboard on this page (Google’s English translation). Sony CyberShot G3 Test photos by digitalbear on Flickr — Nice set of full-sized, unedited images photographed with the DSC-G3. Official websites for the G3 — There’s Sony Style USA, where you can obtain the full list of features, specifications and accessories. For technical and support matters on the G3, visit Sony eSupport. There is an Acrobat PDF Instruction Manual (Large File — 15.82 MB) for the G3, which you can download from this page (or try right-clicking this link to download directly to your hard disk).